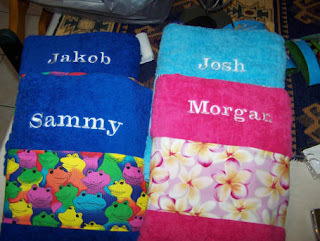 These are a few of the towels I have done up as pressies :) The froggy ones are for the gorgeous Jakob and Sam my friend Nic's little boys....I love the bright frogs on the blue towels! The other two are for my peeps Morgan got frangi's (she loves them too) and JT picked the aqua for something different this year....hope they all like them!! This is a LO done using a sketch by the lovely Liz Weber :) Loved this sketch Liz!! And this is the true princess Morgan....awwwwwww isnt she precious :) I took this pic last week and then fiddled with it on picasa to get that gorgeous soft glow.Wait til Lyns sees this pic she is gonna love it!! Have a fandabbydosey day everyone!! Love those layouts! well done and those pressies look fantastic! Gorgeous layouts Krissy you always make my sketches look good. I just love those towels you did for the kids - excellent idea. Those photos of the frangipanis are devine - they are one of my favs as well. Hope Allan spoilt you rotten Krissy. Hope you guys had a wonderful Christmas with your gorgeous family! !